It’s been speculated for months and is now confirmed: the new stadium being built right now in southern Regensburg will be called Continental-Arena for the first 5 years of operation. The tire manufacturer, known among other for sponsoring the UEFA Euros, won’t pay too much for the naming rights, though. 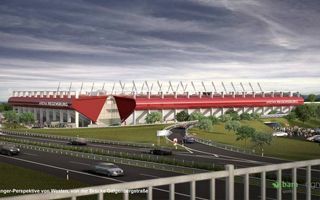 The deal is priced at €200,000 ($274,000) per annum and all of the revenue will be collected by Regensburg city, who are running the €52.7 million new stadium project. 3rd league Jahn Regensburg isn’t going to benefit from the contract. Construction of the 15,115-seat stadium was launched early this year and will most likely end already in 2015 due to simple prefab structure. Works ran by BAM Sports are already very advanced. Almost all primary support pillars are in place across all four stands with only the western side visibly less advanced because of significant infrastructure being prepared under the future seating. From today forward you may see the stadium's construction progress at StadiumDB.com!